Munster have spent more time in the lion's den than the zoo-keeper. Or even the lions. Can ye not just go and win all the games, just for once, and give us a bit of ease? There has to be drama and every Munster game in Europe has to be a final in itself. Will the day be won then by a last-minute drop-goal, after more phases than adolescence, in a den where the lions are too scared to growl? I spotted the languid lion a good few years back in London Zoo, which is near enough to Camden Town, which was once part of Ireland. The Irishness of our London brothers and sisters has never been in doubt and we have a formidable support to call upon for big Munster days out. We will come back to the Irish in London shortly, but for the moment we will stay with the story of the bored lion. The King wasn't doing very much more than sleeping and swishing his tail at annoying flies, as is often the case with bored lions. A small bird landed on the lion's back and he took no notice. I suppose he was too well- fed by the zoo. I was told the lions are fed old dead donkeys and the like, so how then could they fancy a bit of swallow with such delicacies on offer? The bird was on the scrawny side anyway and the lion's paws were made for running, not plucking. I was thinking this lad wouldn't last too long in the Serengeti. Then another bird landed on the lion's mangy rump. He was a thrush. The landing of the second bird was the straw that broke the camel's back. The lion let a savage roar out of him like one of those cross teachers from long ago. The birds flew off in fright as the lion jumped to his feet and I jumped about six feet in to the air. Munster need to stir themselves if we are to win today against Saracens in darkest London. Now I'm not saying Munster are bored lions. But we do need to unleash the beast. I hope you get my drift, as the castaway wrote in the letter he posted in a bottle. Saracens are hot favourites, so hot in fact you'd have to write out the bookies' docket wearing oven gloves. Munster are up against it on paper, especially with conor Murray out. The match day programme will show Saracens have the stronger team, but the only game that was ever won on paper was noughts and crosses. So far this season we have played in fits and starts. Munster were very good for 25 minutes against Clermont and superb at the end of that match when we rescued a bonus point when all seemed lost. Munster never abandon ship, which is why we are still in Europe when many teams would be lowering the lifeboats. The fightback in France gives us hope, as did the big one over Leinster, but more is needed today. The necessary intensity is close to a form of madness bordering on recklessness. We're talking about tackling so hard the opposition eventually lose the will to play and are so worn out from the accumulation of maul and ruck, the legs fall from under them. Rugby is a rough game and Munster used to be the roughest. That's where we need to go to win today in London. But Munster must think their way through the game. They must not give away the ball with careless kicking. Missed tackles will inevitably lead to tries. Our excellent coach Anthony will ask for the loan of ears. Foley knows the game better than anyone and he will make sure we box clever. This could be Paul O'Connell's last European game for Munster. So it is today Munster are playing for Paulie. The thought of his ending the incredible European journey at lunchtime today is a thought too lonesome to contemplate. You just want his show to run and run. 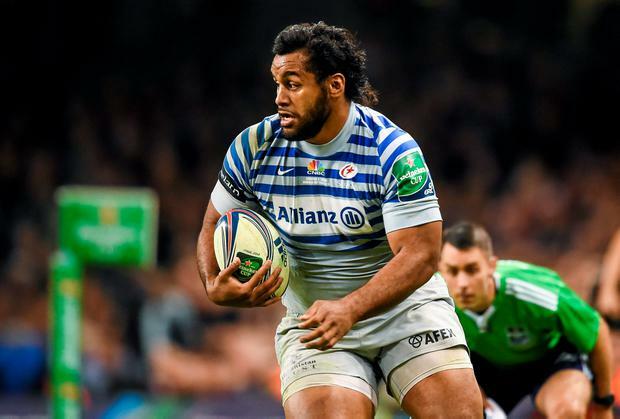 Saracens' Billy Vunipola has done his best for us. Billy don't ever take up a life of crime. You're no Billy the Kid, that's for sure. Billy's parents Singa and Fe'ao are preachers. Their boy is open and truthful. Billy (right) and his brother Mako play for England, and their dad captained Tonga, where the boys were born. Billy said Saracens were far too honest against Munster and should have pulled down the crucial rolling maul that led to the winning try in Thomond. The surface in Saracens' home ground is artificial and fast. The rolling maul will be a potent weapon without the slowing-up process of heavy conditions. This Saracens team is built to run but not to grind. The economics of Premiership rugby and the need to attract crowds to pay the bills dictate open play. Grunt is sacrificed. Munster may have an advantage here. The referee will be on high alert for infringements after the Vunipola confession. Who knows, the ref might even brandish a card or two, and if he does we will win. The artificial surface suits fast wingers and Saracens have a star-studded back line. Owen Farrell hasn't quite hit form this year. We wish him well but maybe he could delay his return to brilliance for one more game. The Irish in London live for days like this when home travels over. Saracens put it about on their website that "callers with an Irish accent will be treated with suspicion." There was no racism here. Saracens' accents alert was just an understandable plan to pack their Allianz stands with home fans. Ah, but Saracens have left the key under the mat for Munster. The fact is, there are as many Munster supporters with English accents as those with an Irish brogue. The Irish who emigrated to London and the Irish born in London are in most ways more Irish than we are here at home. It is the sense of being and belonging that sets the London Irish apart in Babel. So what if our London brigade have a London accent? Our London Irish will cheer for Munster today and even though we were given only 10pc of the tickets, we should make up 30pc or more of the crowd. Home is away and home is where the heart is and the voice of Ireland had many inflexions and variations. So we do have a chance, with our foreign legion cheering us on, and with that history of fight to tap in to. Tradition must count for something and transition is the template for the revival. The Munster lions will roar and sometimes when you care as much as Munster do, the winning will travel upwards from the heart and convince the head it can be done. Billy Keane Margaret had a bounty on her head. She was dead meat they said. Her days were numbered anyway and the escape from captivity was considered to be no more than a stay of execution.